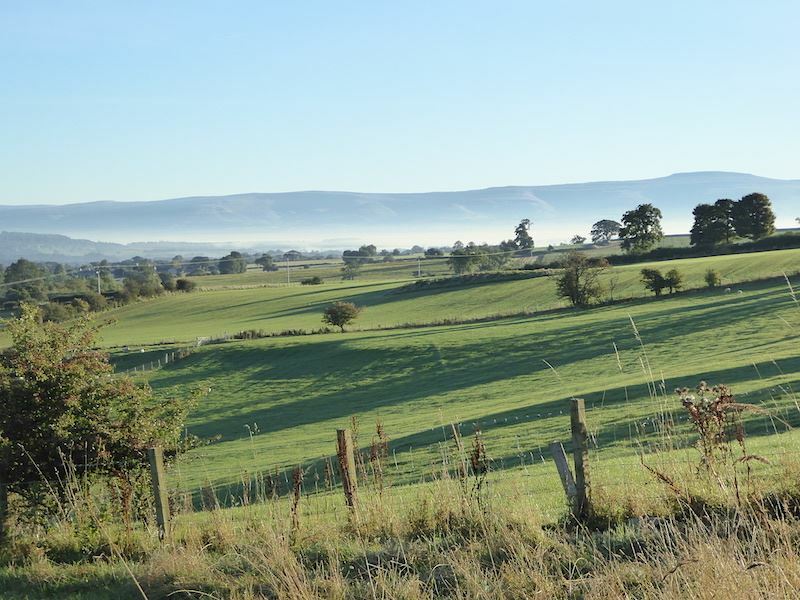 Early morning mist in the Eden Valley as we drive to Glenridding. 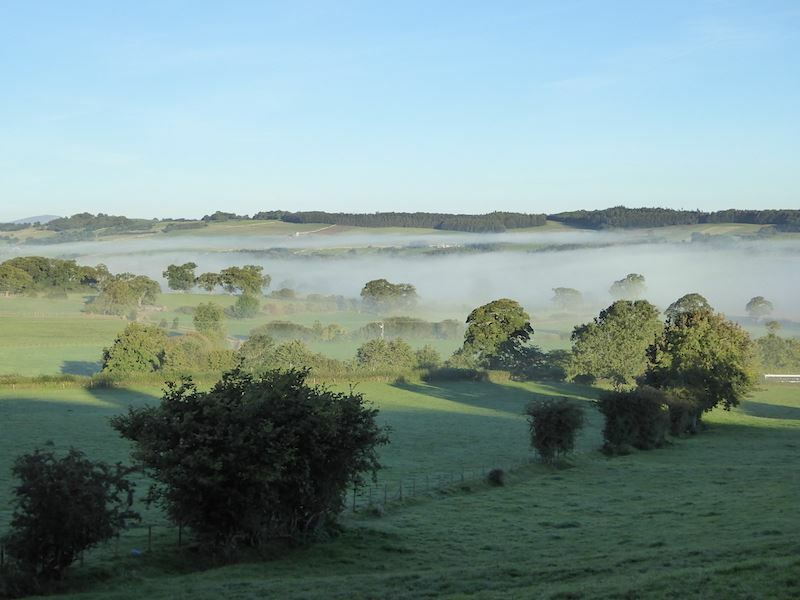 Mist drifting gently between the trees and the landscape gradually turning autumnal. 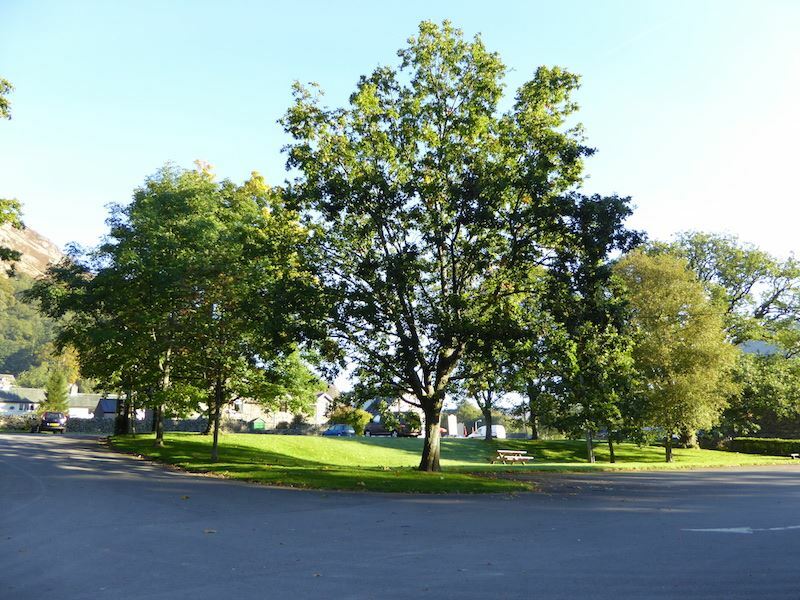 The car park at Glenridding. No mist here and not many people either, although it’ll be busy later on no doubt. Walking through Keldas woods we have a view of Heron Pike, part of Sheffield Pike, the summit of which is way over on the left. 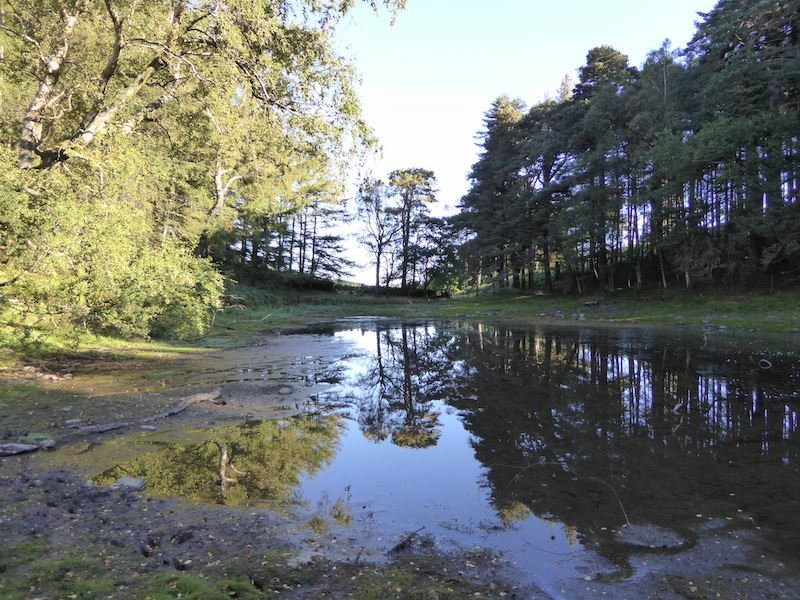 I tried several times to get a good shot of Lanty’s Tarn but it still looks a bit gloomy. The sun wasn’t quite high enough while we were here to provide plenty of light. Now that we’re clear of the woods the view has opened up quite a lot more. 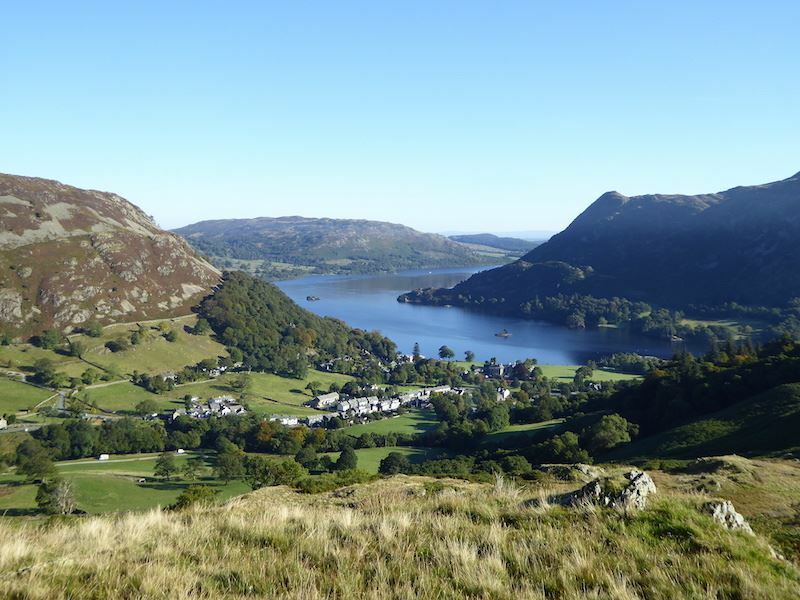 Ullswater is flanked by Glenridding Dodd on the left, Gowbarrow Fell in the centre, and Place Fell on the right. 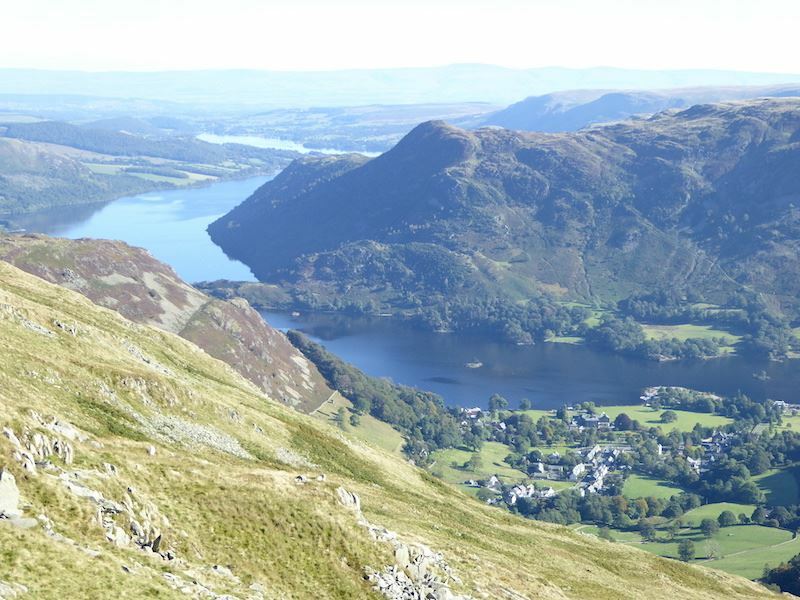 The village of Glenridding down there in the middle. 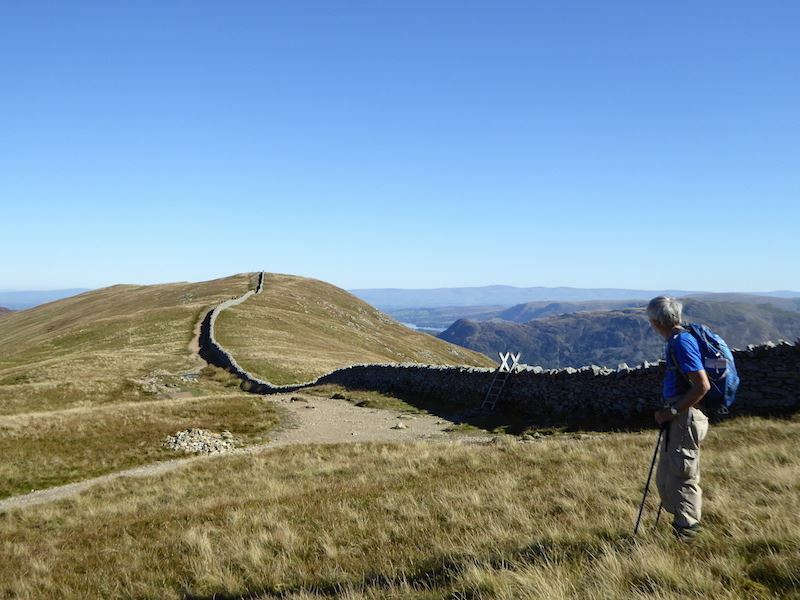 Following the wall path up to Birkhouse Moor and we get our first view of the Helvellyn range. 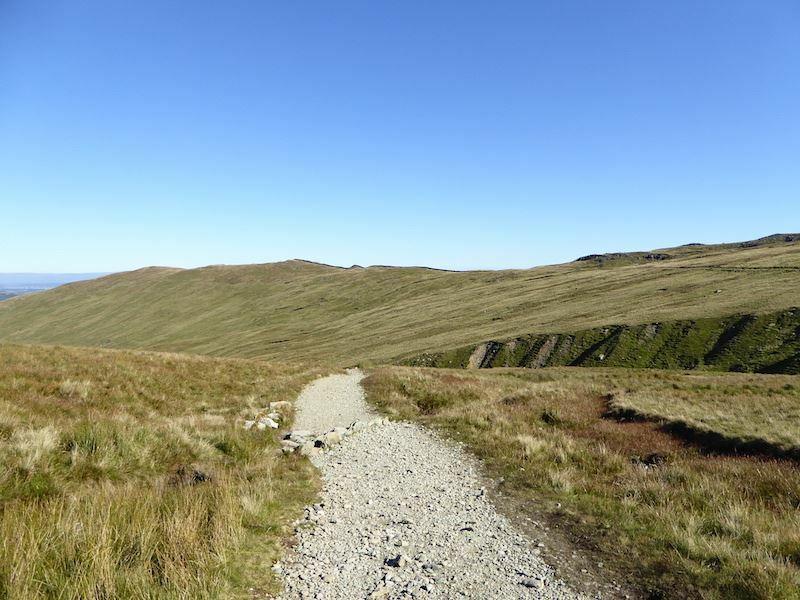 Fleeces and jackets no longer required, its becoming very warm work as we make our way up to Birkhouse Moor up there on the skyline. 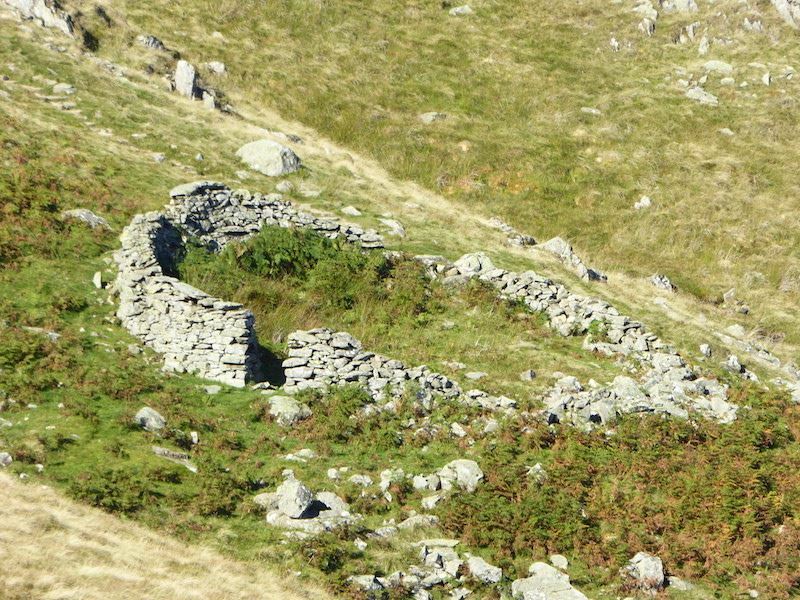 I noticed this sheepfold on the fell side below us so I took a close up of it. Any excuse to stop for a minute and mop the brow. 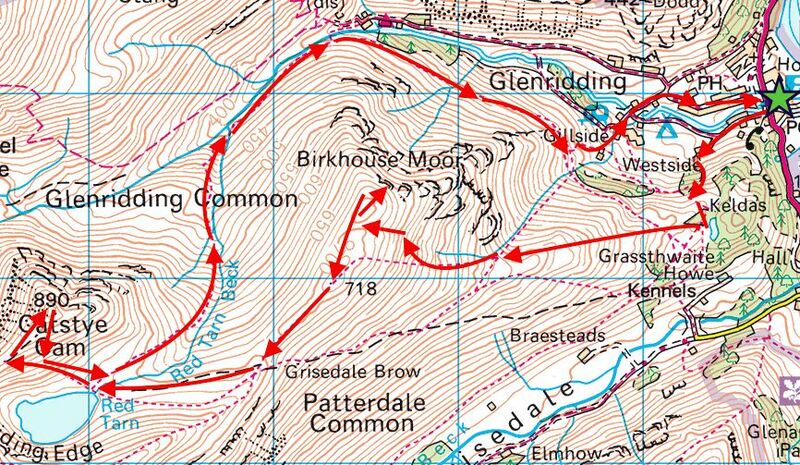 A look back at the route we have been following. 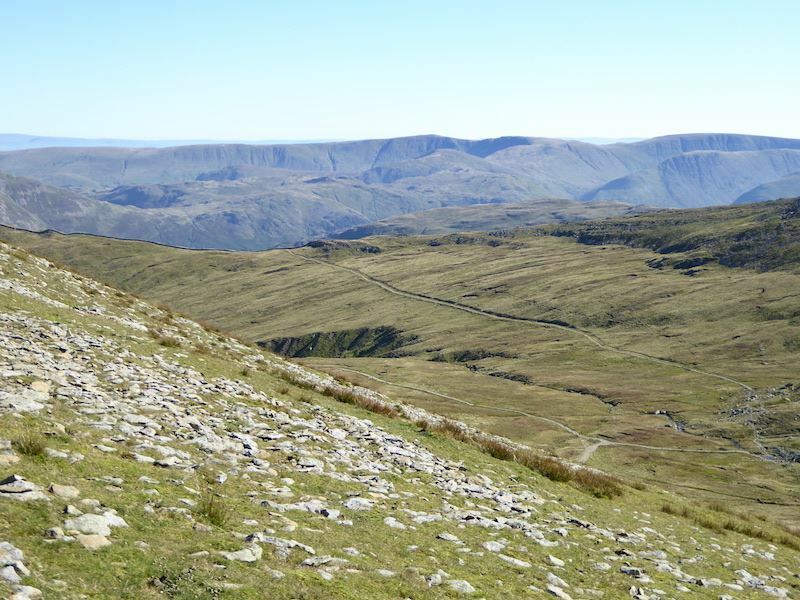 More of the eastern fells are coming into view now. 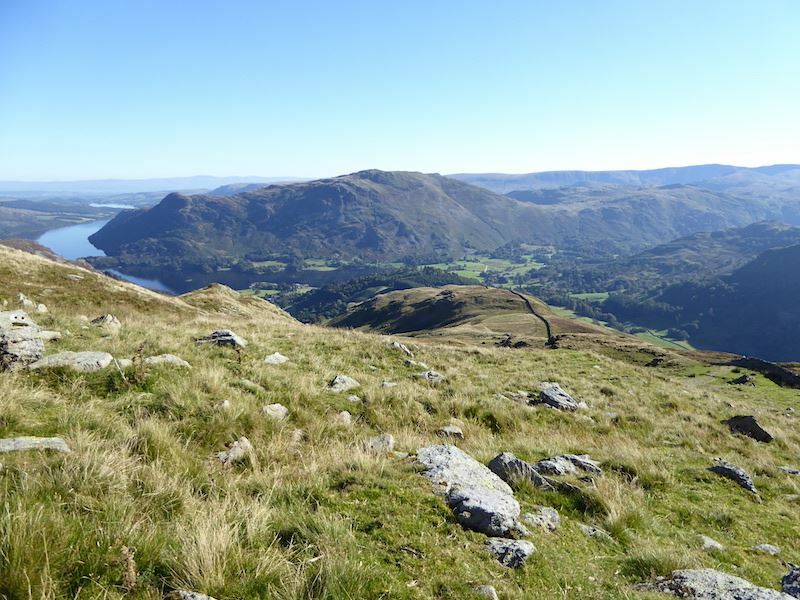 Almost on Birkhouse Moor ridge now and a great view of Glenridding, Place Fell and Ullswater. 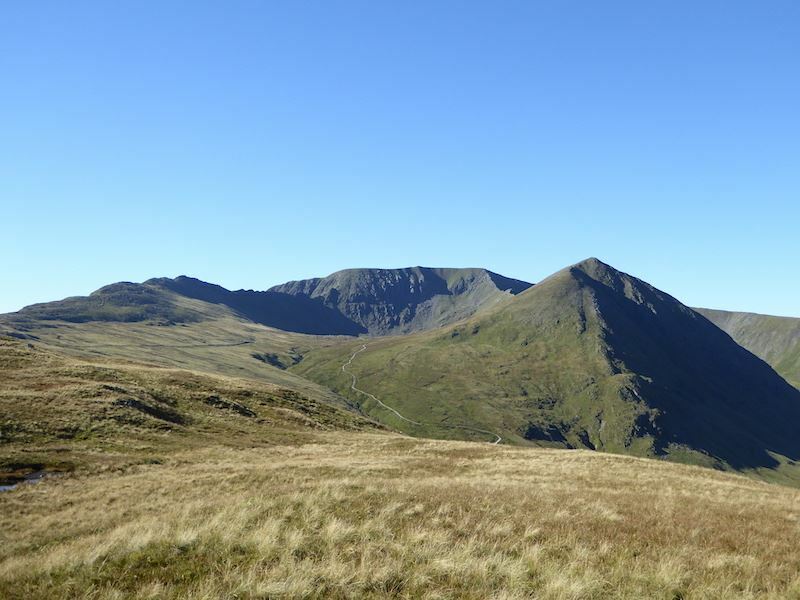 On the ridge of Birkhouse Moor with a view of Helvellyn in the centre, Catstycam on the right, and Striding Edge in shadow over on the left. 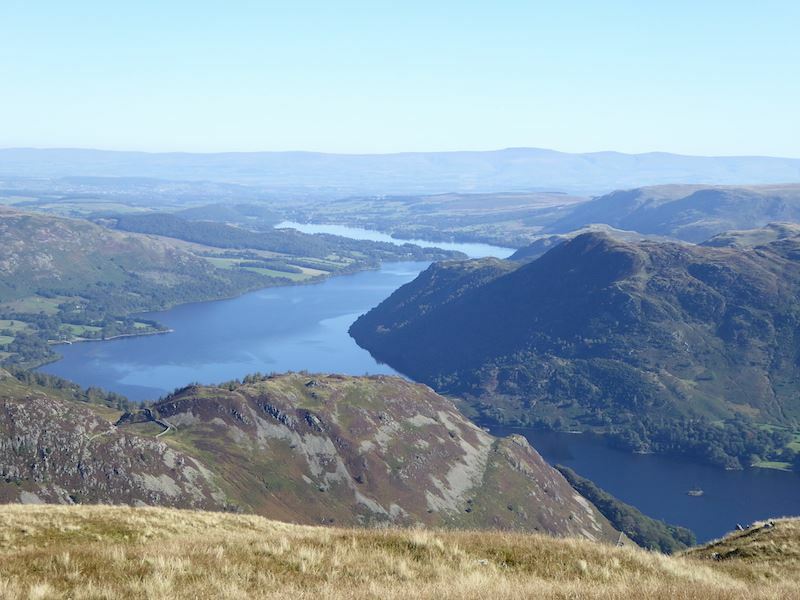 We walked over to the north top of Birkhouse Moor for this fabulous view down Ullswater. This isn’t the summit, that’s further back behind us, but this has the better view. 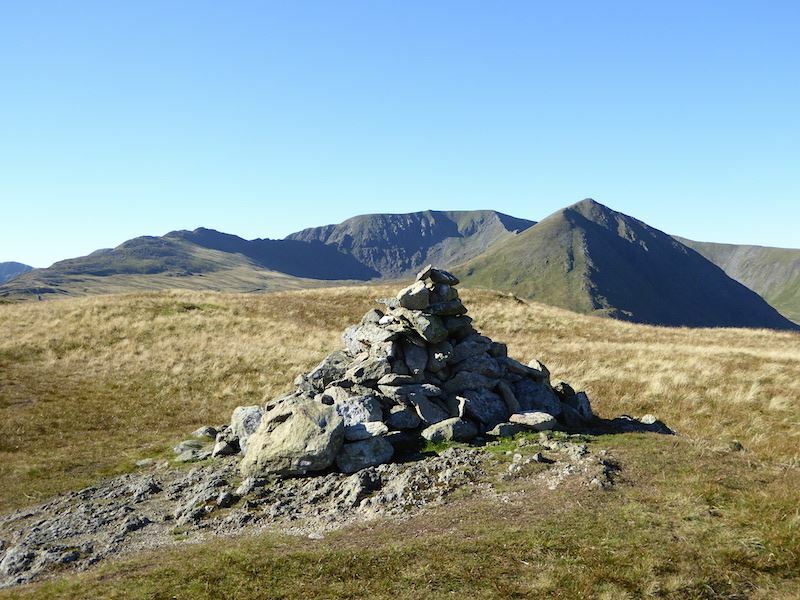 Helvellyn and Catstycam from the cairn at the north top of Birkhouse Moor. 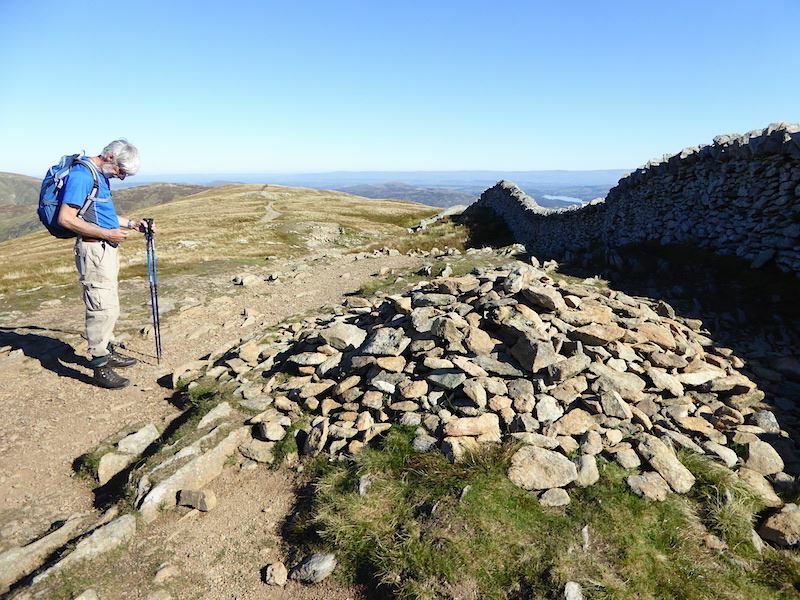 The cairn marking the summit of Birkhouse Moor. 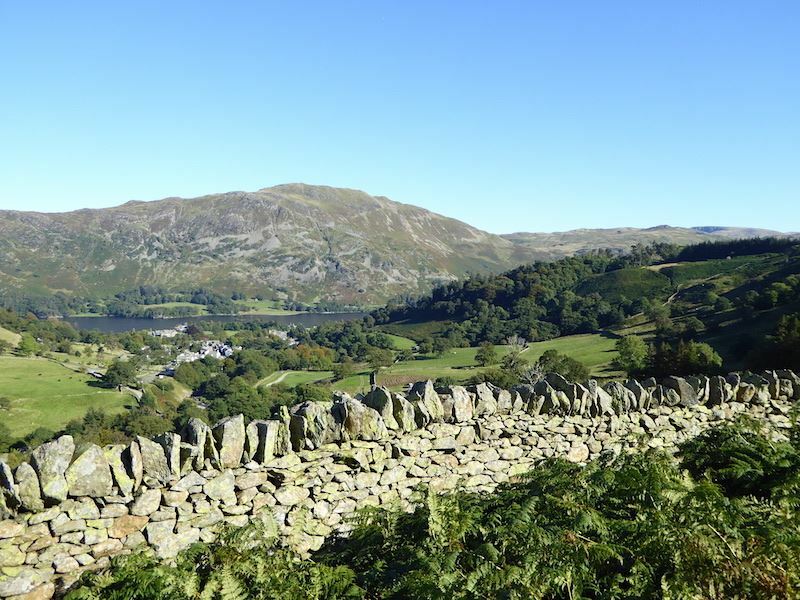 The limited view of Ullswater through the dip in the wall shows why the short diversion to the north top is worthwhile. Shorts and t-shirt? Hard to believe that its the first day of October. 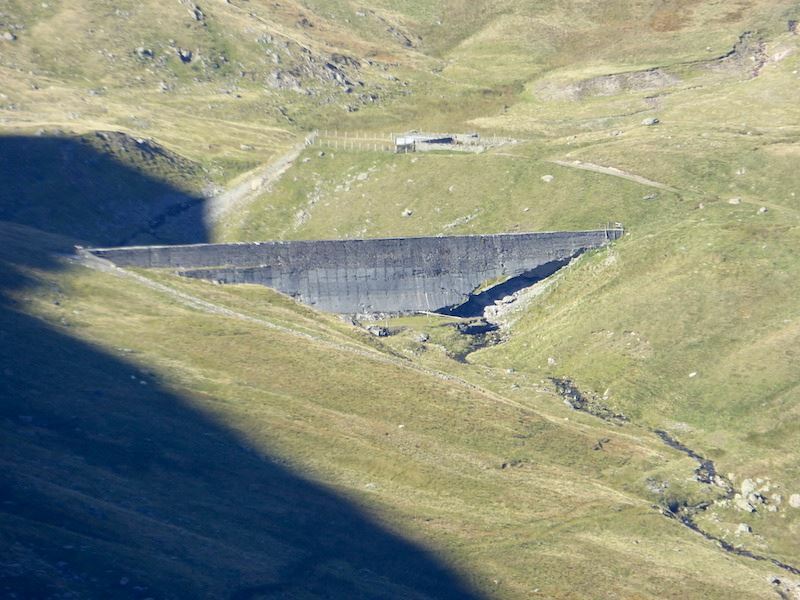 The dam in Keppel Cove, In 1927 the previous dam was washed away in a storm. This concrete dam replaced the old one, but it was also breached in a storm in 1931 and never repaired. 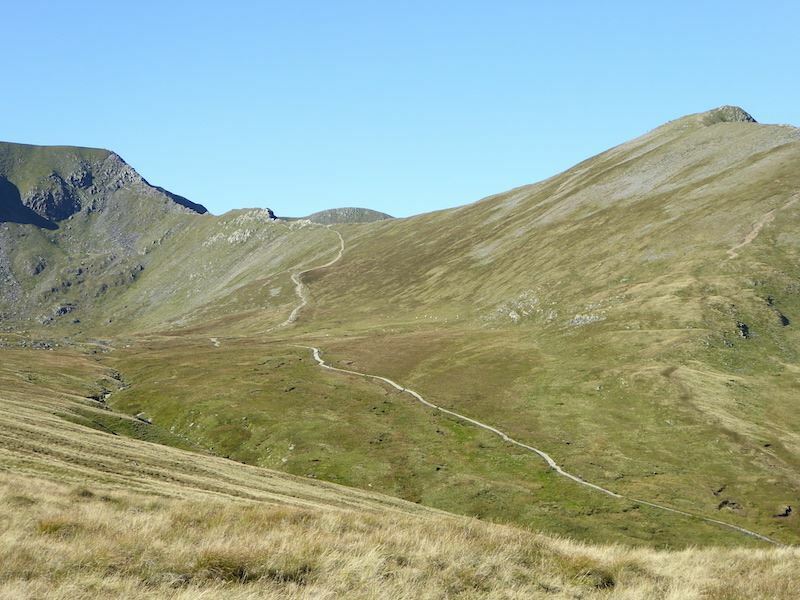 Catstycam, and the path from Glenridding which leads up to it and also to Swirral Edge, which is over to the left. 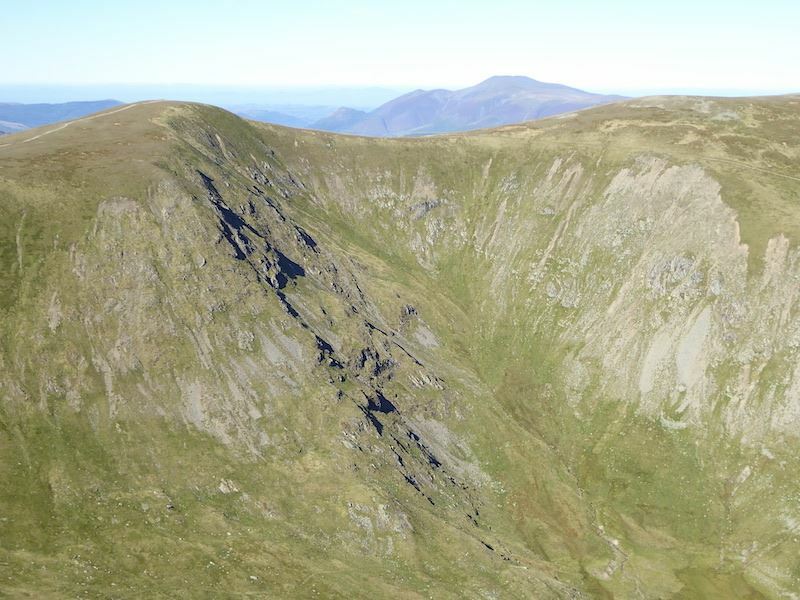 The headwall of Helvellyn, with Striding Edge on the left and Swirral Edge on the right. 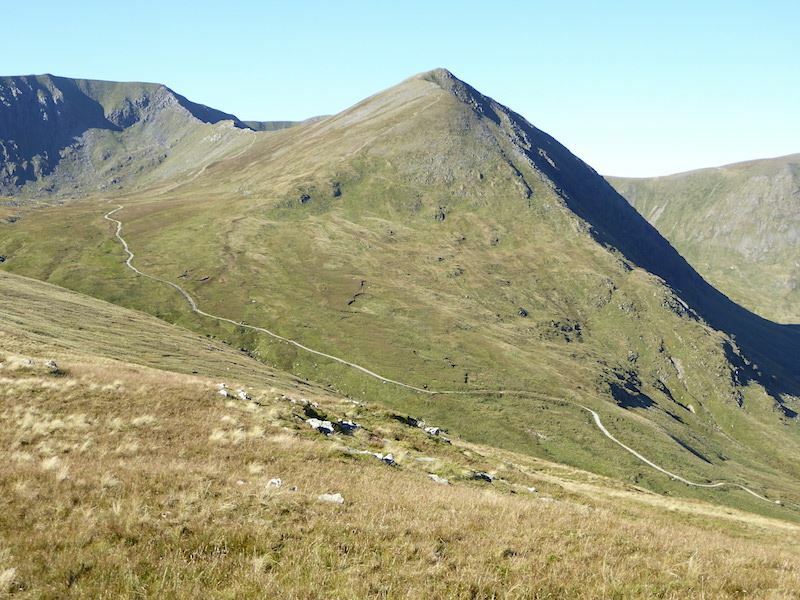 The long sweep from Catstycam to Swirral Edge. 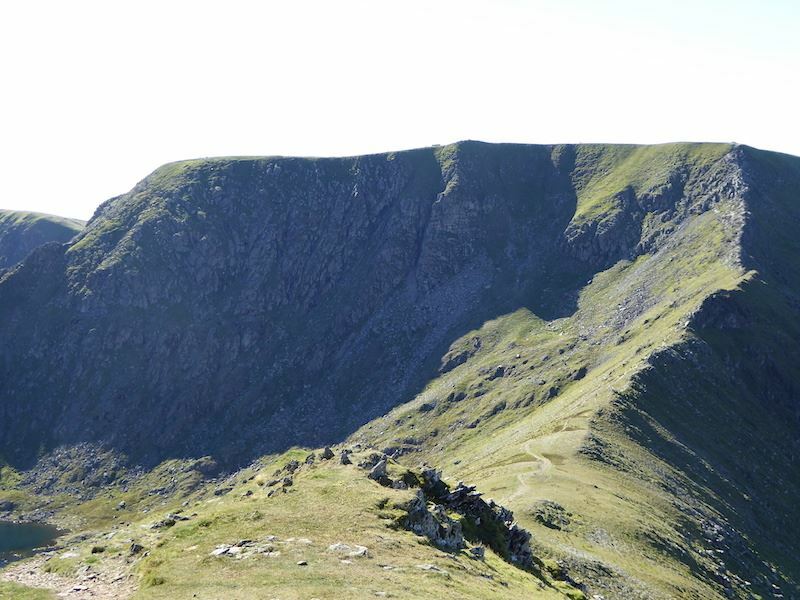 A well known landmark, ‘The Hole in the Wall’, which leads to …..
….. the start of the path across Striding Edge, leading eventually to the summit of Helvellyn. 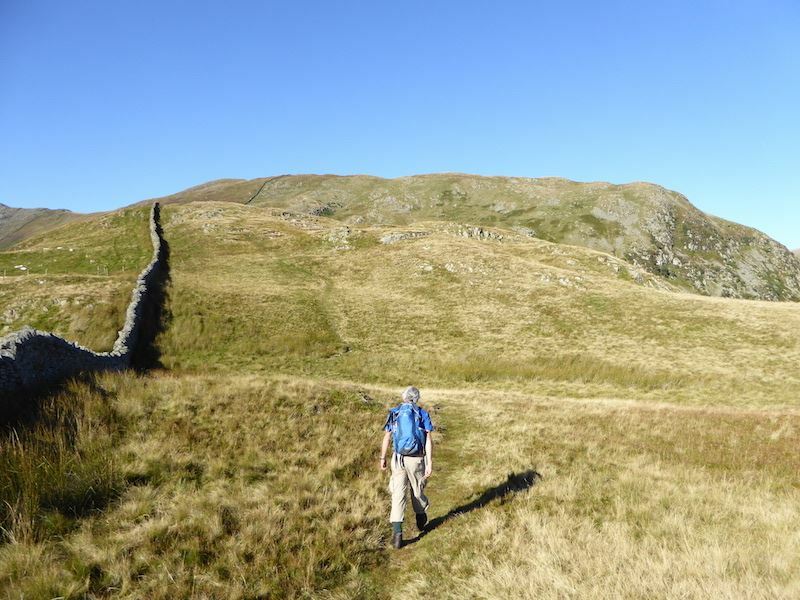 Looking back at our route across Birkhouse Moor. 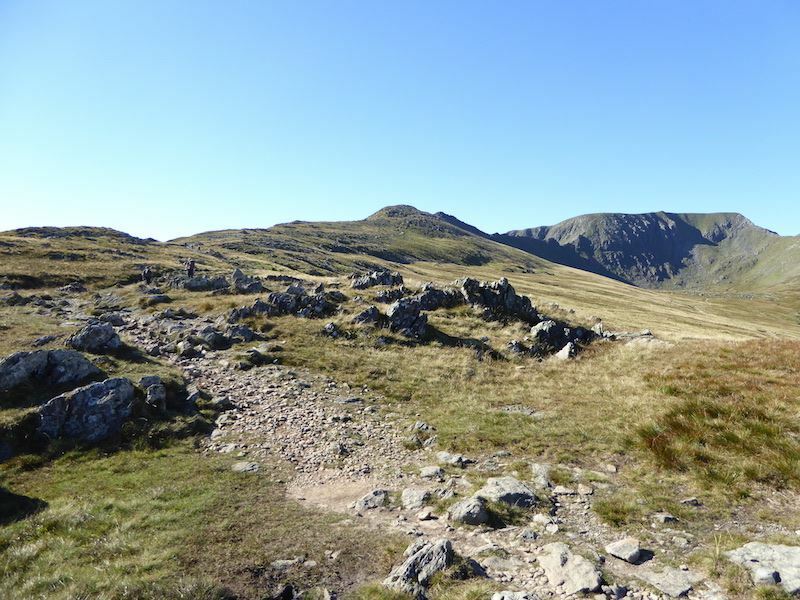 A close up of the ‘climb out’ area at the end of Striding Edge. 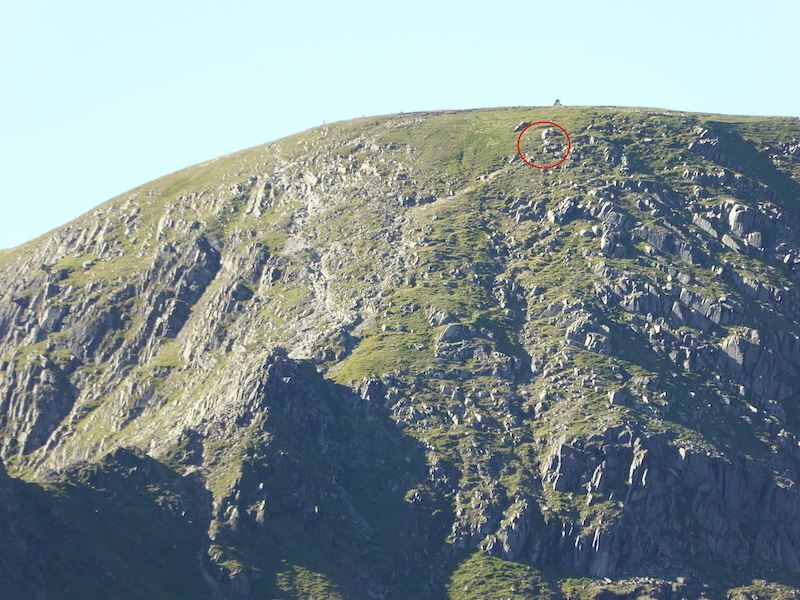 In the red circle are two walkers who have already made the crossing and are on their way to the summit. That’s not the summit just above their heads, that’s the Gough Memorial, the summit is a little way over to the right and isn’t in the photo. 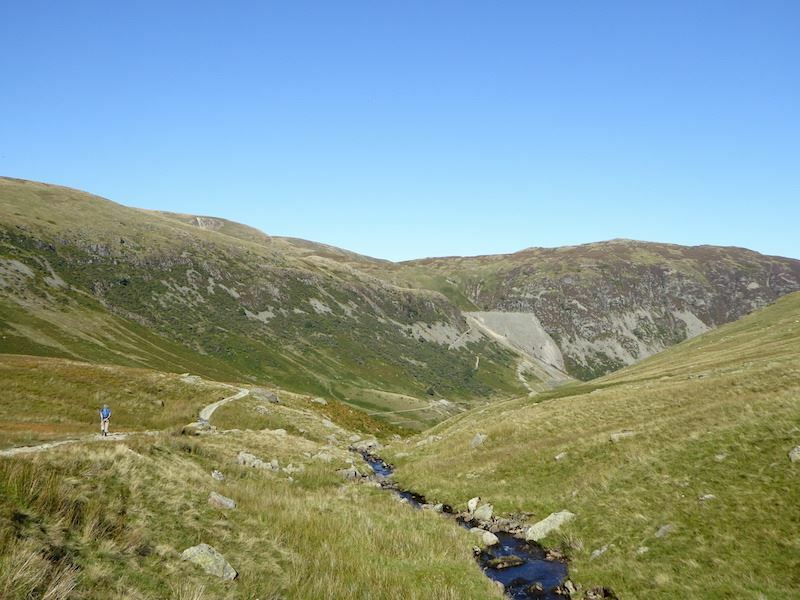 Looking down at Red Tarn as we sweated our way up the path making for Catstycam. It was now very warm indeed and that water looked so inviting. 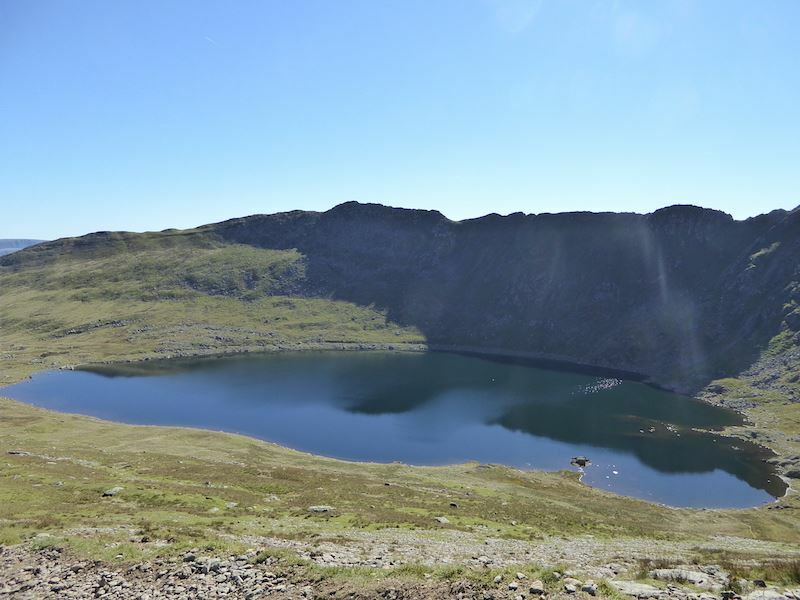 A group of youngsters had just walked to the tarn and were having a very pleasant time paddling and swimming, judging by the whoops and yells coming from down there. From here we have a good view of the path we’ve been following up to this point. 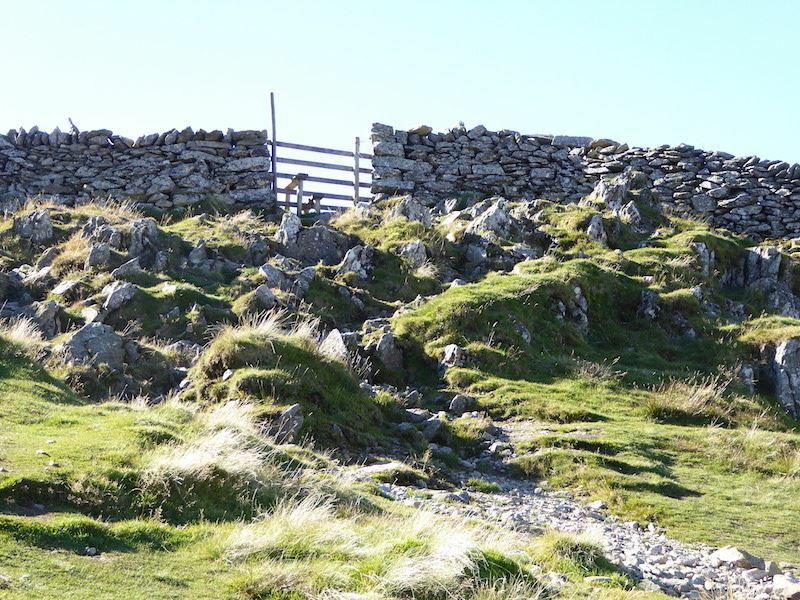 Where the upper path meets the wall towards the top of the shot is where ‘The Hole in the Wall’ starts. Yep, up there. 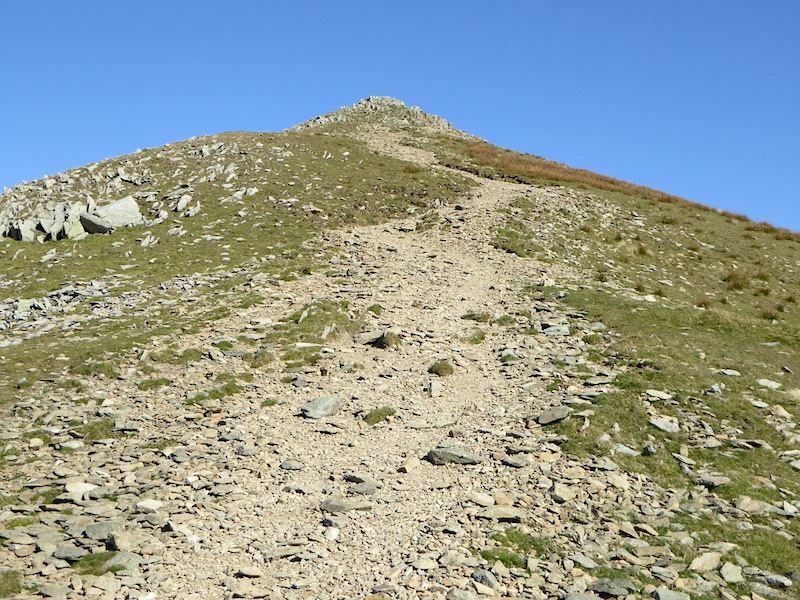 The last little bit of the climb up to Catstycam summit. 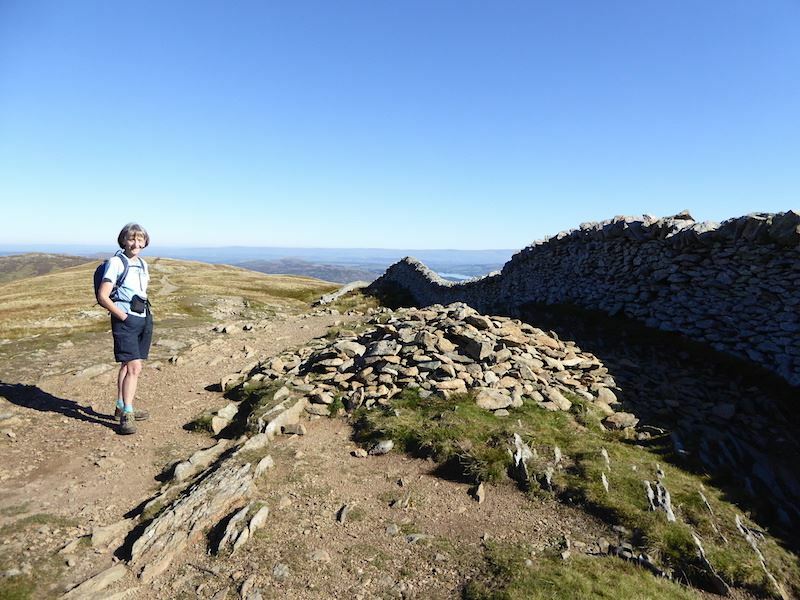 Its a bit warm for a steep climb but no complaints, we came up here a couple of years ago in June and got pelted by a hailstorm. 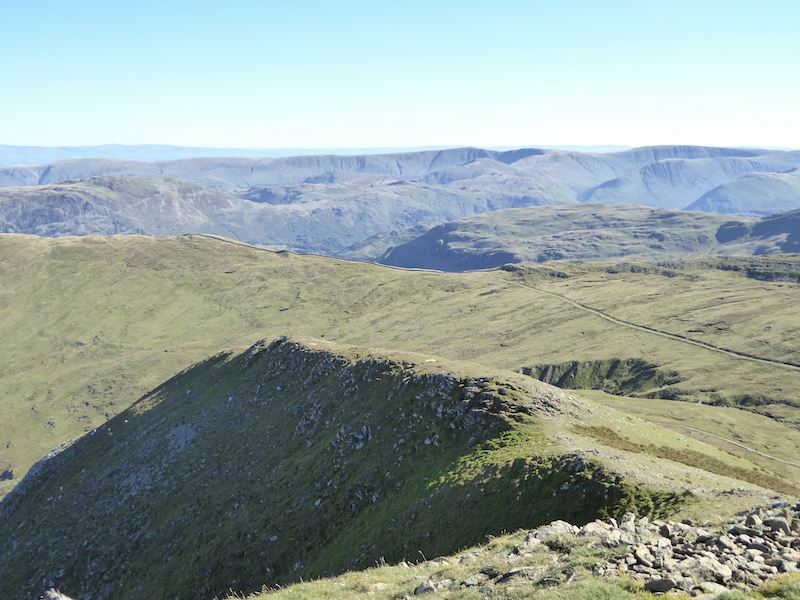 The annoying thing was that on that occasion the day had started out just like this one but by the time we got to this point huge black clouds appeared over Helvellyn and that was that. We got a soaking despite the waterproofs and no views either. 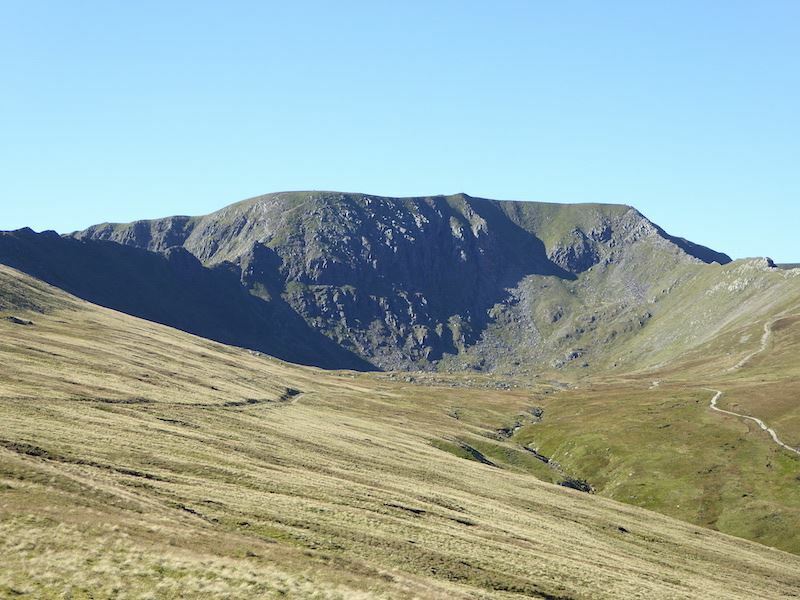 I’ve had a quick look and there’s nothing like that over Helvellyn today. 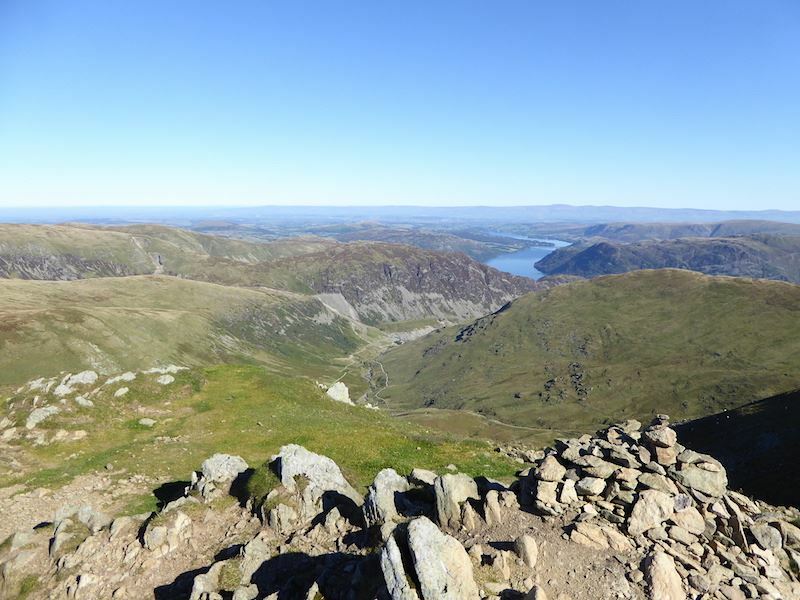 I don’t know how many miles you can see from Catstycam summit, but it must be a heck of a lot on a day like today. Its also a heck of a long way down. 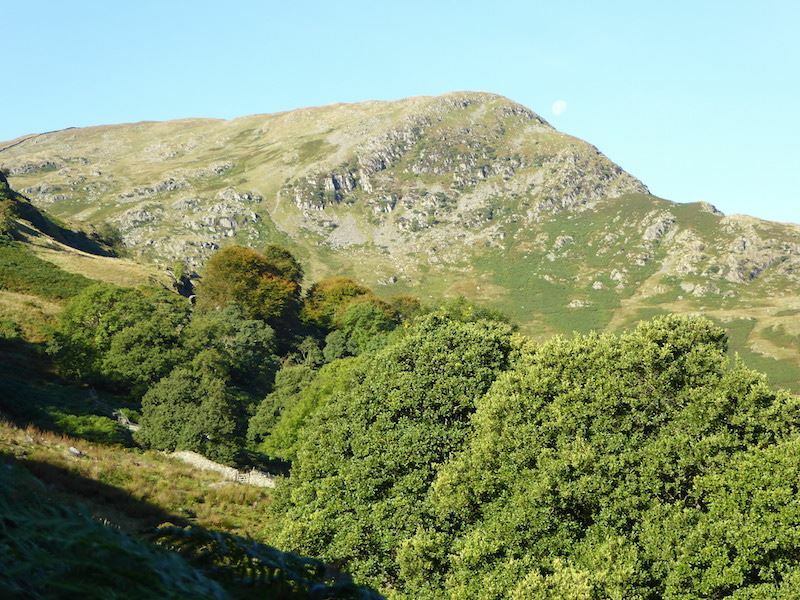 We’ll be returning to Glenridding by that path on the right hand side of the beck down there. Looking east at the fells on view over there, from Catstycam summit. 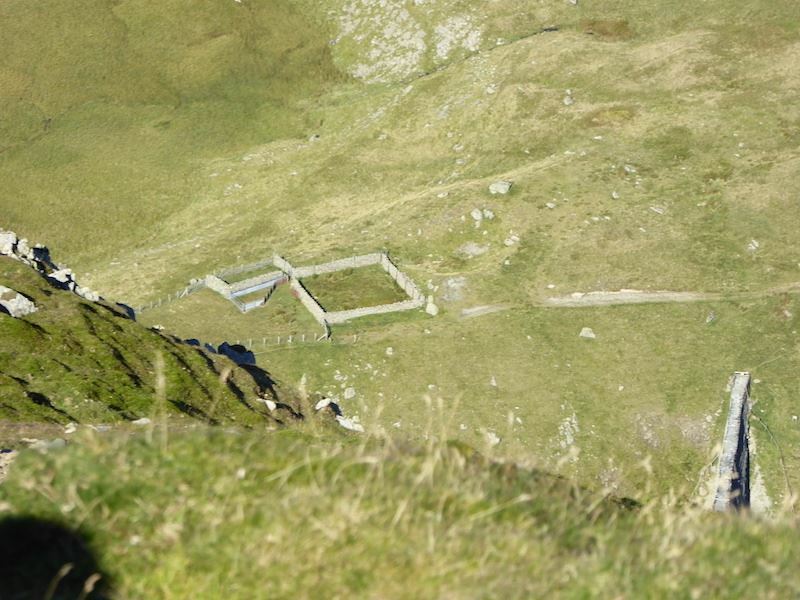 A dizzying close up peep over the edge at the sheepfold way below us, with the breached dam down at the bottom right. 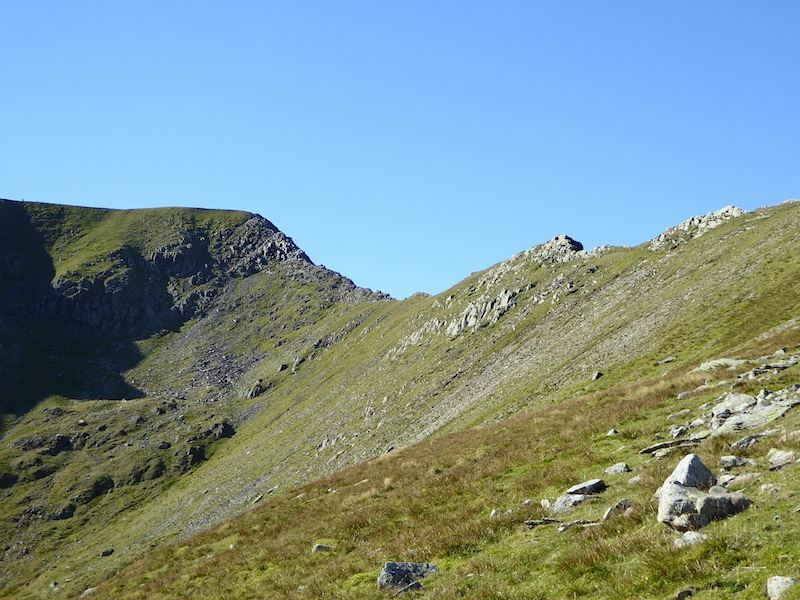 The Swirral Edge route up to Helvellyn, with Hellvellyn Lower Man over on the right. 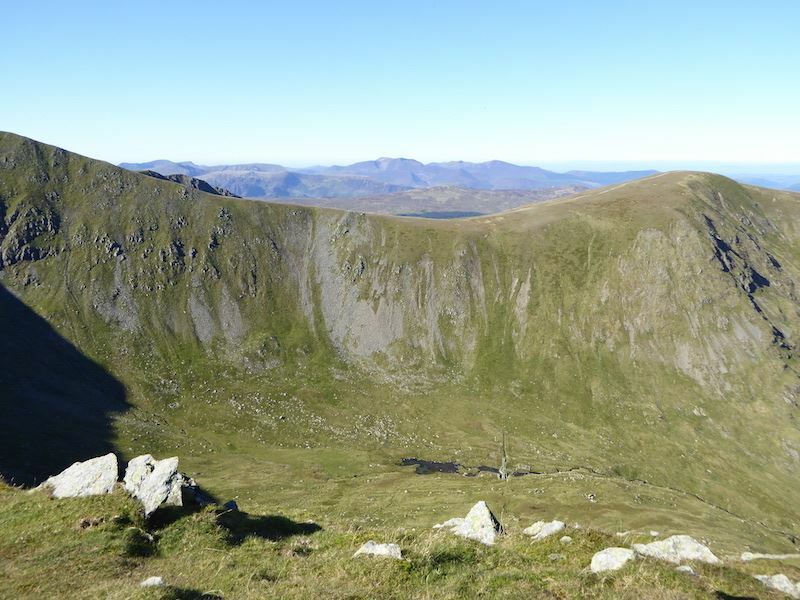 Looking west over the Lower Man – White Side col.
Now looking at Skiddaw behind the White Side – Raise col.
From Catstycam looking down to Red Tarn, Striding Edge was now very crowded with a constant stream of walkers passing along it. 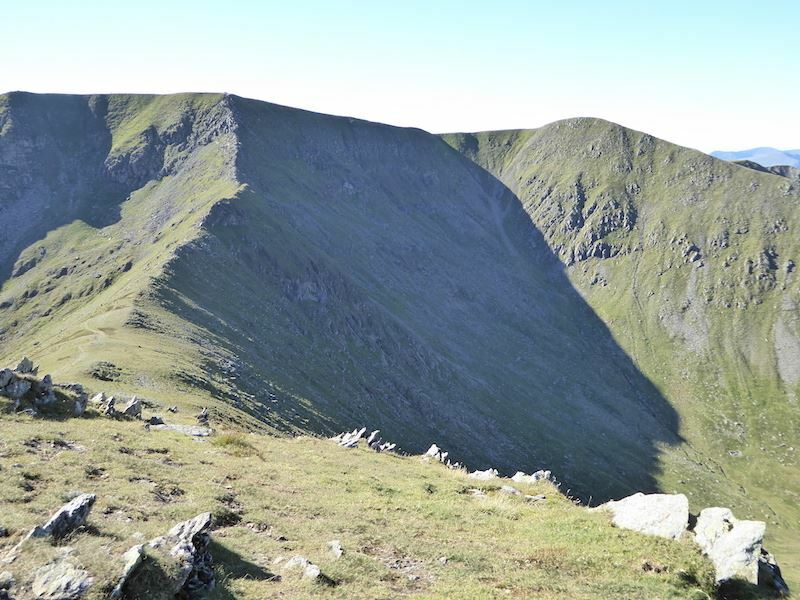 It doesn’t look in this shot, it but Helvellyn summit and the routes up to it were constantly busy with walkers today. 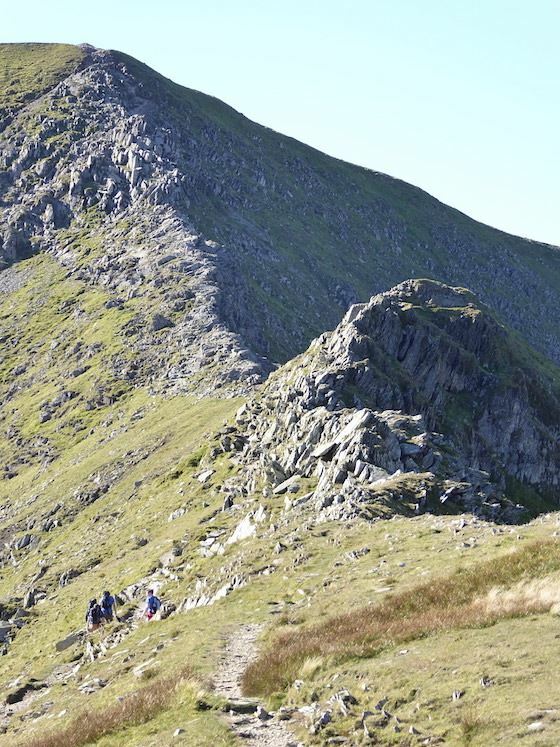 Another group of walkers setting off up the Swirral Edge route. 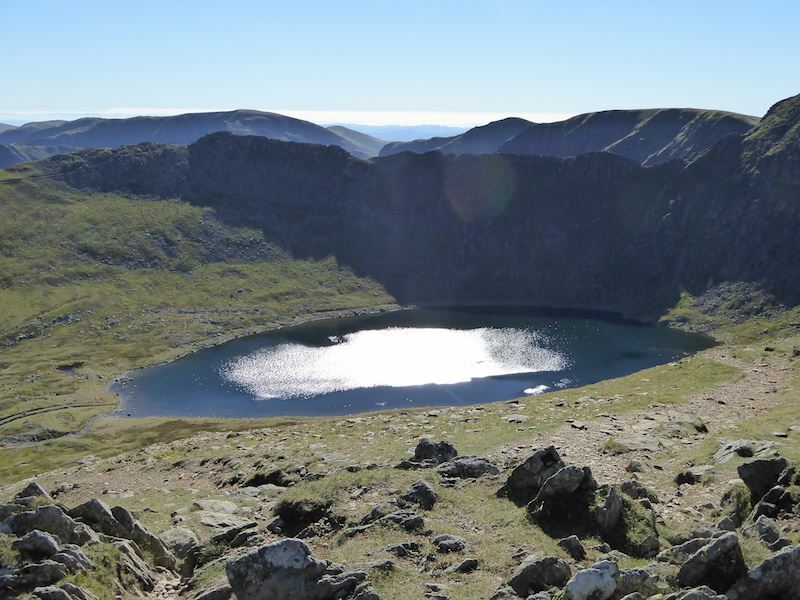 We left the summiteers and dropped down into this little sun trap just above Red Tarn and had our lunch. 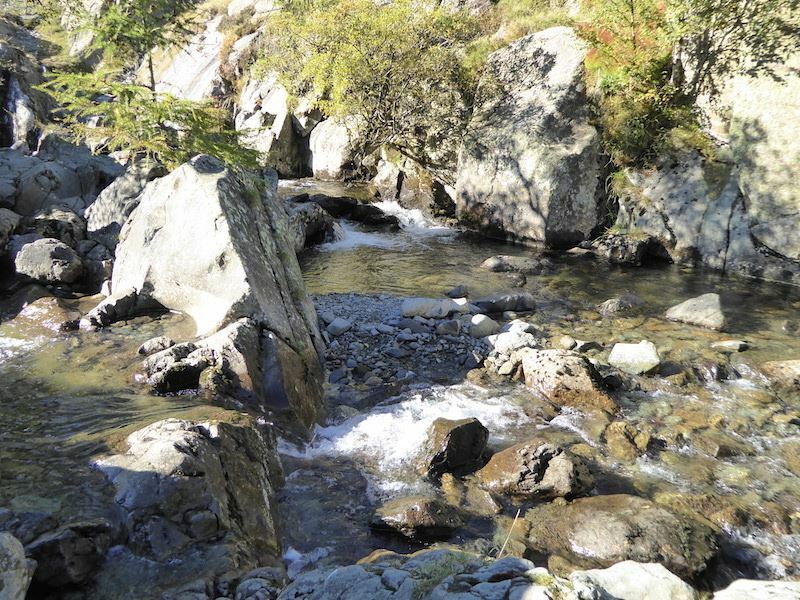 Very warm and peaceful, well apart from the yells of the youngsters who were still splashing about down below us. 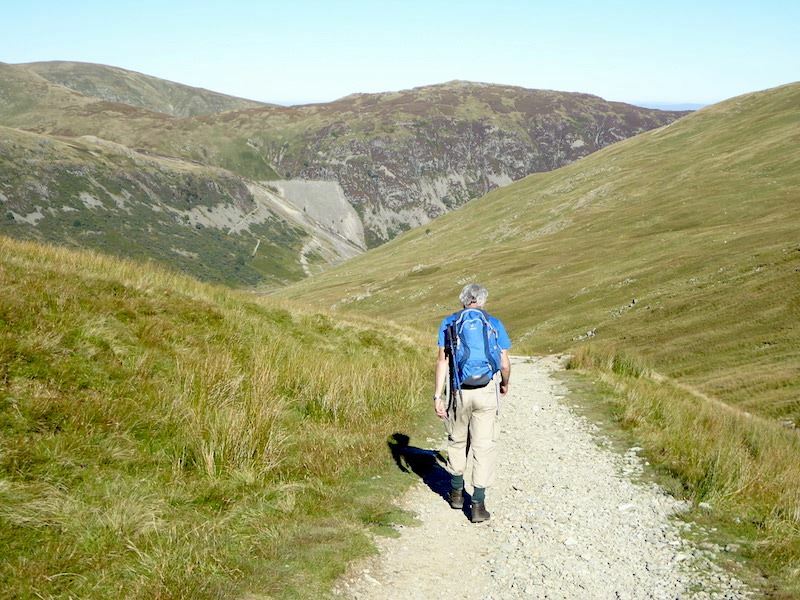 After our lunch break we set off down this path for the return journey to Glenridding. All the way down we met people who were on their way up, all of them sweating profusely in the afternoon heat. Making our way back down the long path. 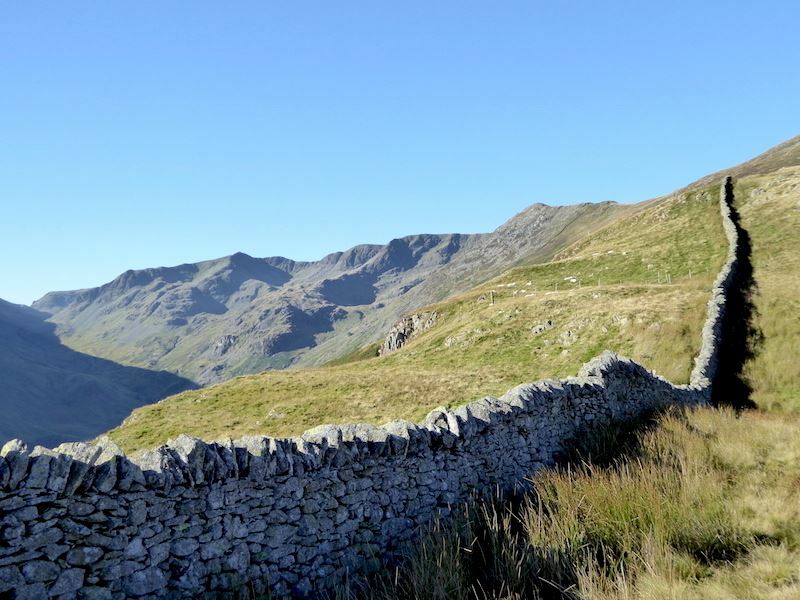 Ahead of us is the old Greenside Mine and above it is Sheffield Pike. Still making our way down this very long path. Further down still and there’s a lot more path left to walk down. 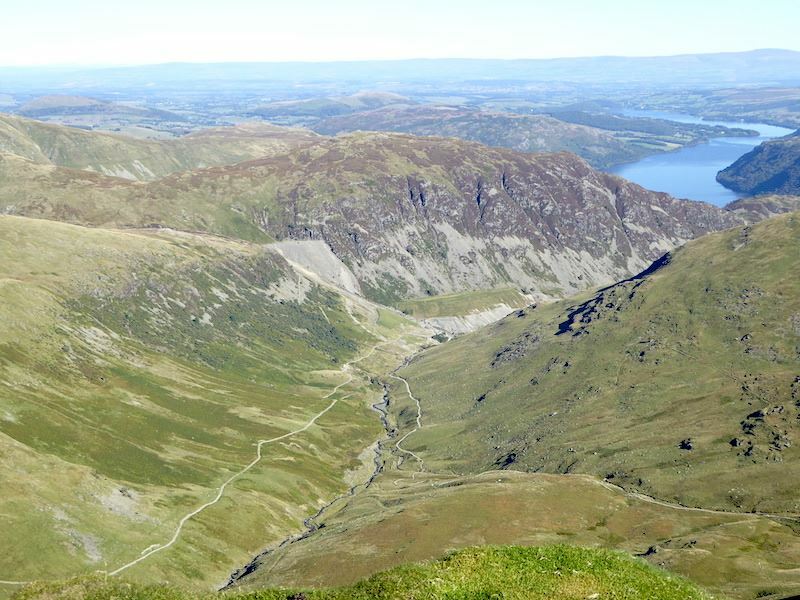 Just follow the yellow brick road, Glenridding is down there, I promise you. 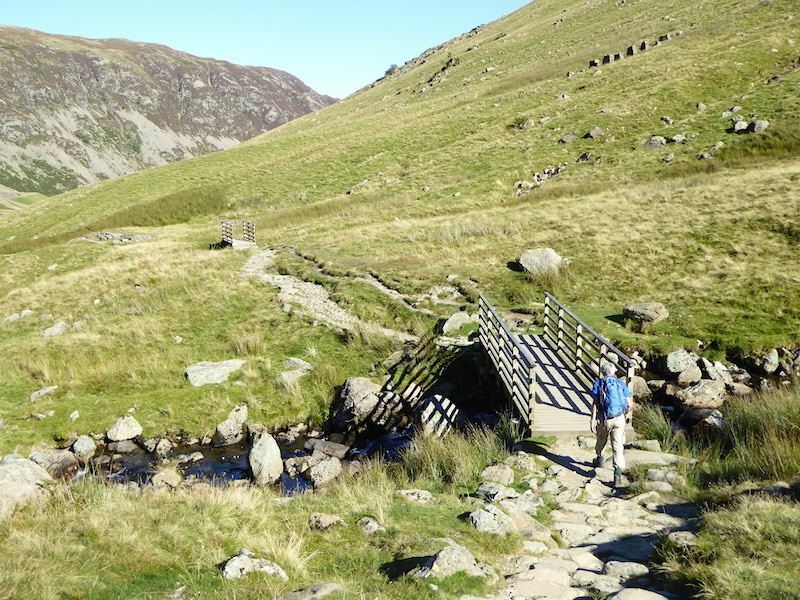 Bridges, becks and boulders all the way down. 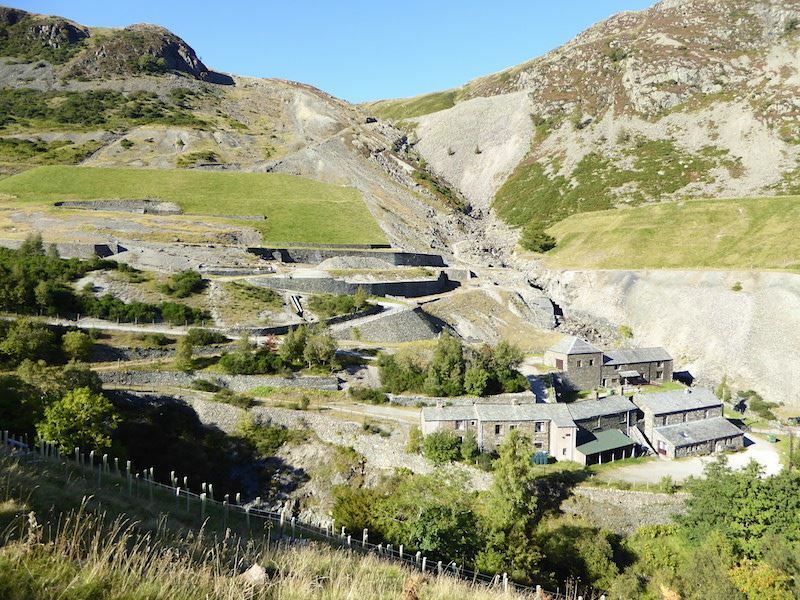 This is one beck we didn’t cross when we reached the its bridge, the reason being that we wanted to stay this side of the beck to take this photo of …..
….. the former Greenside Lead Mine which closed in 1962, after almost 300 years of operation. 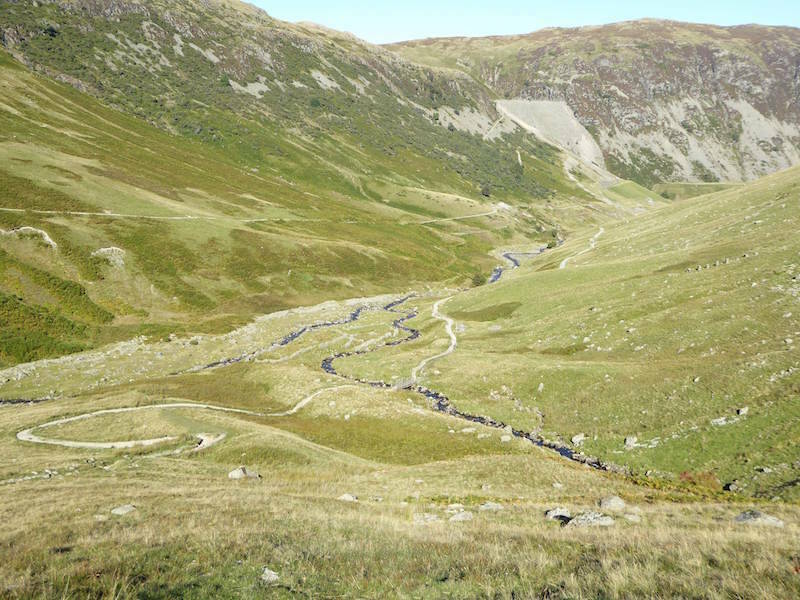 If you cross the beck you walk through the area and can get a closer look at the buildings but not the whole of the site. 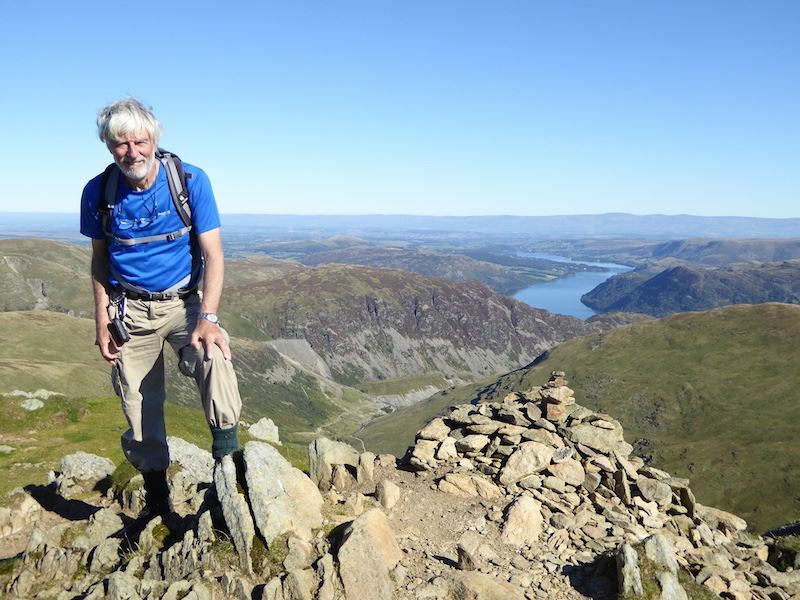 Almost down with a view of Place Fell and Angle Tarn Pikes over on the right skyline. 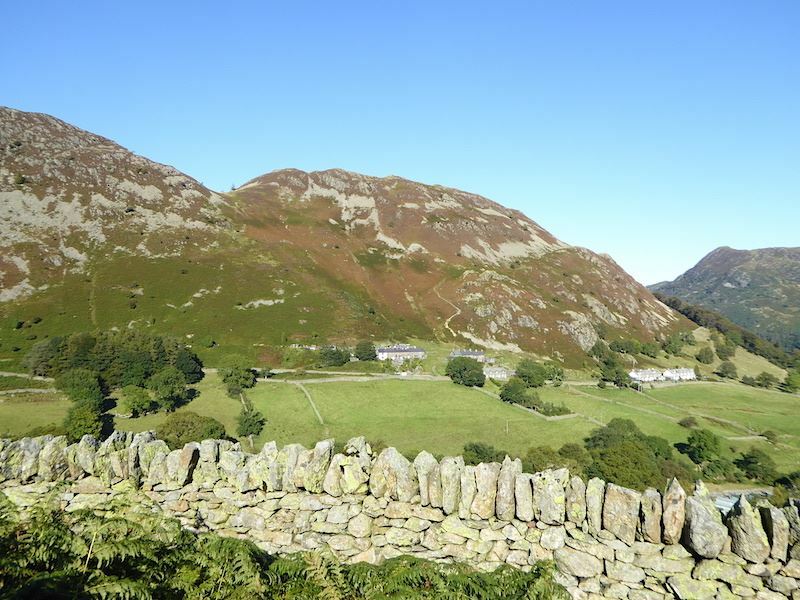 Across the valley is Glenridding Dodd. 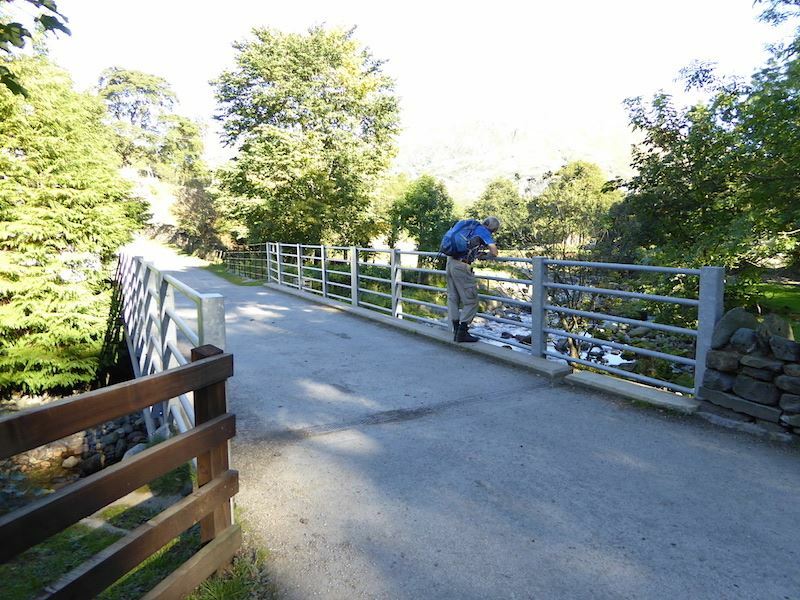 Rattlebeck Bridge. We last came across here in 2011 when the railings were made of wood, I don’t think this is an improvement. 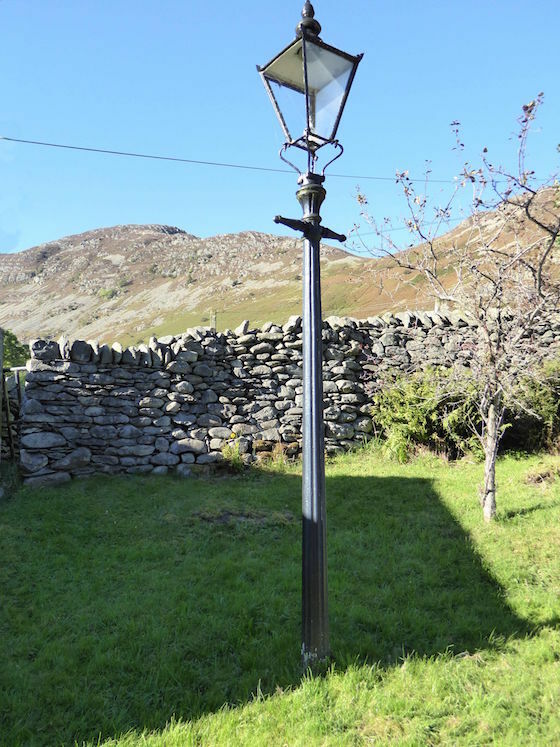 Now a garden ornament, but I can remember when they were still on the streets and lit by gas. 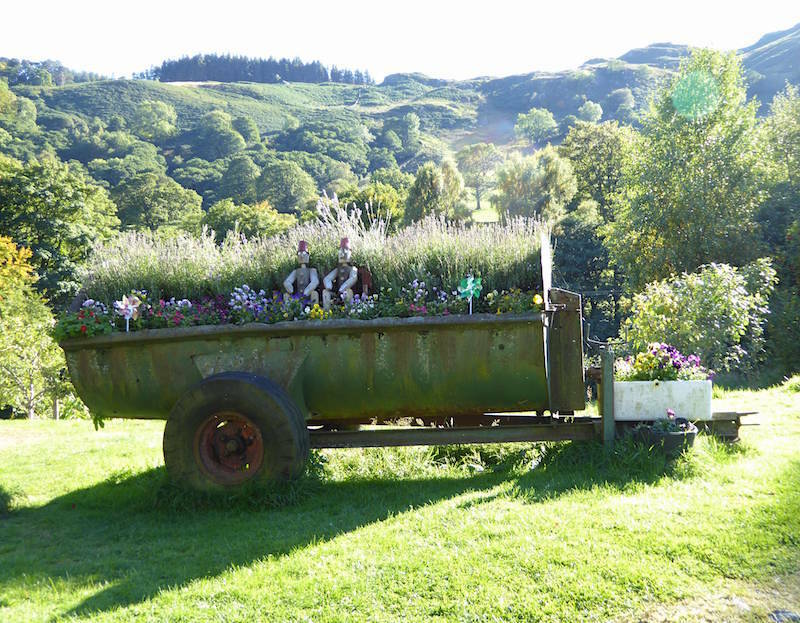 An old muck spreader put to good use in a Glenridding garden. Bill and Ben look to be taking a tea break, and as we aren’t that far from home, a short drive will take us home for our tea break too.